“I have cycled for 30 years on various bikes (Peugeot, Cannondale, Trek, GT…) and it was always my passion, but I gave it up 10 years ago due to numbness in the groin and increasing issues around dysfunction. I went into running and after 10 years of pounding the pavement my joints ache and I was concerned my days of being active outdoors might be over. I decided to give cycling ONE LAST CHANCE but I admit I was nervous that the issues that made me quit in the first place would re-emerge, and using a traditional saddle they did. I decided to try different saddles and researched all of them. I tried several with grooves in the middle (they can be more damaging than traditional saddles as I found out) and noseless saddles (no pain but you lose some steering ability – scary on the 40 mph downhills…) and everything in between. In short, nothing was optimal and I was resigned to quitting again. “But I came across Rido Sprinter on the internet and I decided to have ‘one last go’ at it. When it arrived I thought it looked like a standard saddle with a bit of a groove cut out of the middle, so my expectations were low. I put it on my racing bike (a Trek Madone) and tilted the nose down a bit (forcing me to sit farther back on the seat which in turn forces me to sit on my ‘seat bones’ rather than my groin) and it actually felt good. I took it for a 30 mile ride and for the first time, possibly ever, I felt NO discomfort or numbness in the groin. I was a little sore – similar to how it feels when you get back on the back after a long period off – but that was because the seat was forcing me to sit correctly for the first time ever, so those bits were sore. I have ridden it for the past 2 months and I am still amazed there are no issues. “The RLt sprinter is fantastic. The best seat I have ever ridden on. I have been road riding for 33years ( not continuous ) and this seat is by far the most comfortable seat I have ever used. Several of my friends have them now and all of them are happy with the RLt sprinter, we do a lot of long rides 4hr + and not numb bits at the end! “Have been getting on much better with RLt. Did have a problem with it when I first got it but have persevered and now it is great for road rides with club up to 80 miles – I find that as the weeks go by the more time on the Lt the comfier it is. Have now got 3. I am now actually swapping some of my bikes that had the R2 for the Lt as I find the R2 is feeling too big and soft and is rubbing the back of my leg, e.g. my main winter/commute bike is now with an Lt. It was a nice surprise and I can only heap praise on how amazing my new RIDO RLt saddle is. I only got back into cycling about 5 months ago after an 11 year break from the sport. Back in the day I remember during and after a long ride I would be conscious of the saddle soreness and I could not enjoy the simple pleasure of riding my bike and keeping fit without the niggles and chafing on the saddle. Well 11 years later I had forgotten about those days when I brought my new bike and with great enthusiasm I hit the road for what I thought would be a new beginning of cycling enjoyment. “Well after a couple of months I was at the point where the cycling bug had completely taken over and I was hooked again. However there was only one problem. Every time I jumped on the bike I dreaded the uncomfortable feeling I was about to endure in the saddle while doing something I loved and should be enjoying. Enjoyment soon turned to dread and I thought to myself, how long can I put up with this for. Well dread soon turned to relief when I ran into an old friend who is heavily into cycling and who uses an RLt. He praised the seat and its virtues and how it has totally changed his life on the bike. I jumped on his bike and took it for a short ride and the difference in the saddle was instant. It was remarkable. The pressure I felt on the saddle was where it should be and there was not a hint of perineal discomfort. “I thought to myself, ‘I’ve got to get myself one of these’. That night I jumped on the internet, ordered my RIDO and in less than a week it was on my doorstep in Australia, ready to use. Can I tell you that ever since I have been using the RLt I have not had one bit of discomfort and cycling is once again a joyful and comfortable experience in the saddle. No matter if I am on the flats or riding up a steep hill, the symmetry and design of the RIDO RLt enables me to ride pain free but at the same time allow me to use my own body against the saddle to generate the force and power I need. “The RIDO RLt is an engineering marvel which already has and will change the lives of cyclists around the world. Professionals or amateurs alike will benefit regardless of the type of bike you ride. It is that good, that if it’s not other riders enquiring about the unique look of the saddle on my bike, simply, through word of mouth, people will not be able to help themselves in telling others about it. “I bought the Rido RLt to improve ride comfort and reduce the after-effects of training rides. The saddle meets both requirements. I ride for fitness with triathletes almost every week. Being a runner for over 40 years I thought the lack of padding on my anatomy and the saddle would have created problems but not at all. “I have to say I have hardly been aware of it (the RLt) – which is I guess the idea! “My RLt has been great. I was off the bike for 7 months following a crash and when I returned I had pressure on places that I (mostly) never had to worry about. I have done several longer rides now, over 45 miles, and have not suffered at all. I’m a big fan of the Rido R2 and their sportier RLt. Basically, it’s designed so that your sit bones rest up on a little shelf which drops off to give your bits (lady bit or man bits) room to breathe. I’ve put over 6000 miles on mine (including two tours from Houston to New Orleans), and I can say that it’s easily the most comfortable saddle I’ve ever ridden. “I think this Rido Lite saddle is fantastic. When I bought it I did not read the instructions carefully enough and decided that it was not up to the job. Having had a return of prostitus I refitted it and read the instructions this time. So I made the front dead flat and hey presto I can ride 200 miles in a day again. I ride Audax events 200-600 kilometres. 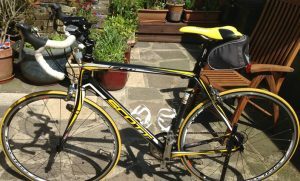 “Just a quick note to say I’m a charity sportive rider, so far weekend training, 80mls & 70mls rides saddle superb, very comfortable, no bad side effects!